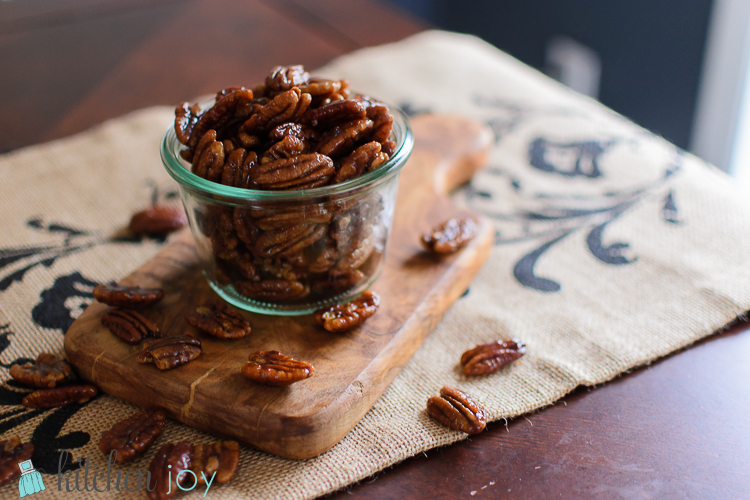 Spiced pecans are the perfect holiday snack or homemade gift to share with those you love. 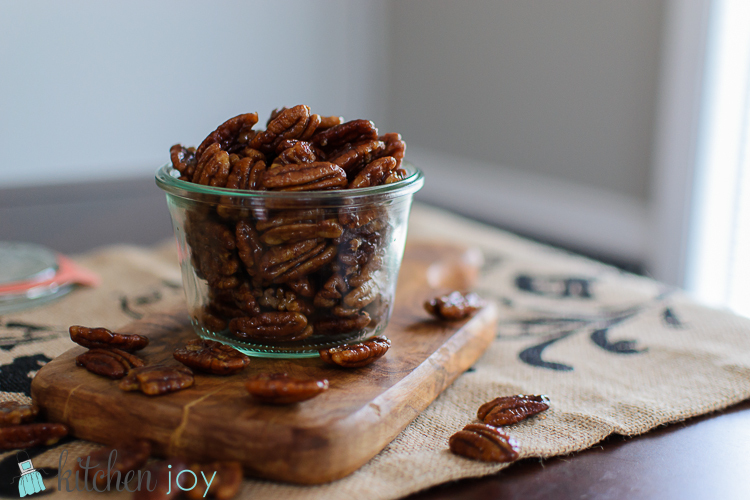 Spiced pecans were sort of a happy accidental discovery for me. While finalizing my plan of attack for the Thanksgiving menu, I thought I would try to add a little extra kick to my pecan pie. Something to offset an otherwise extremely sweet dessert. 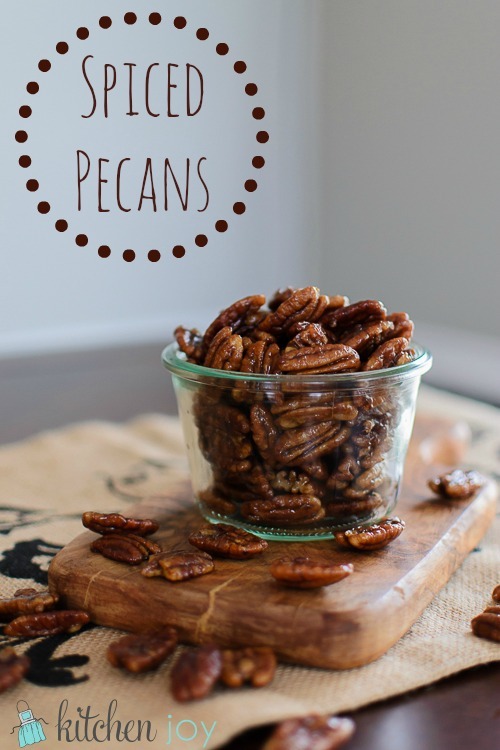 Making the pecans themselves more flavorful seemed like the way to do that. It wasn’t until after I had toasted the nuts and coated them with butter, brown sugar, cinnamon, maple syrup, and cayenne pepper and watched them glisten with their shiny deliciousness while they cooled that I tasted them and realized it was going to be a battle to save enough of them to actually be used in my Pecan Pie. Hands down, my new favorite treat. I have made 3 batches in 2 days. I even have a baggie of them in my purse….you know, for if I slide off the road and find myself trapped in a snowbank and need sustenance. It’s about survival, folks. In a small bowl, combine the salt, cinnamon, and cayenne pepper. In a large skillet over medium-low heat, toast the pecans until fragrant and beginning to brown slightly. Add butter, stirring until melted and pecans are coated well. Sprinkle salt/spice mixture on pecans and toss to coat. Add brown sugar, maple syrup, and water, cooking over low heat, stirring constantly until liquid has thickened and coated the pecans.This takes about 3 minutes. Spread pecans in a single layer on the parchment-lined baking sheet and let cool completely before storing in an airtight container.